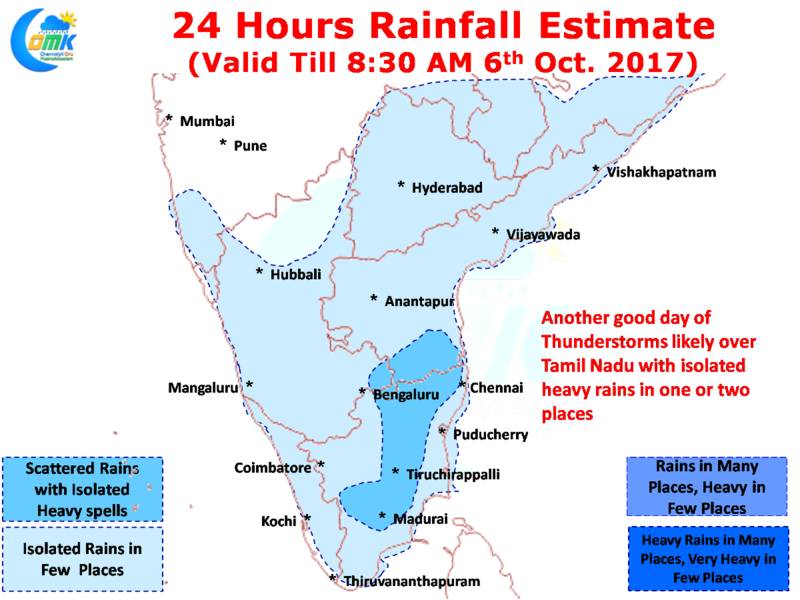 The active thunderstorm season has been continuing over many parts of Tamil Nadu with yesterday seeing another good day with rains in many places and a few places recording heavy spells of rains. 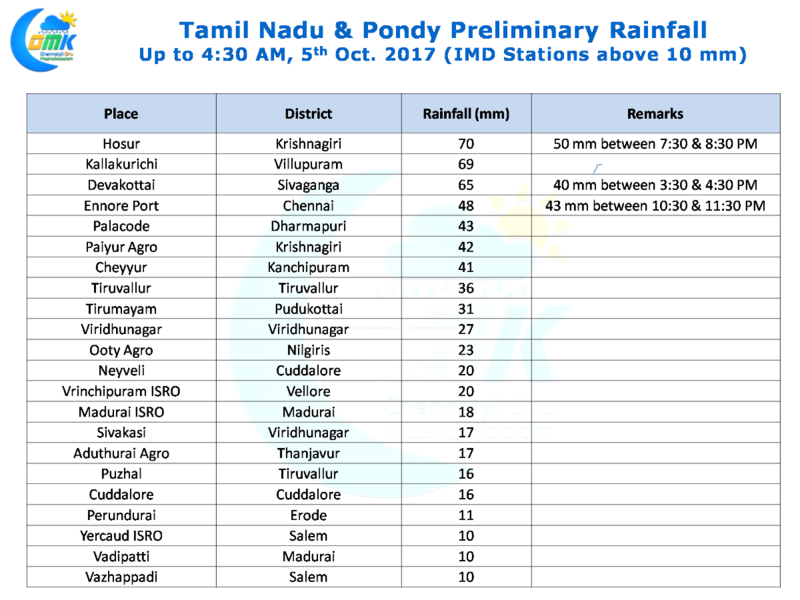 Parts of Chennai recorded some spells of rains though the widespread rains like Tuesday did not happen. Ennore Port continued its dream run since the turn of October accumulating 20 cms till today. With the overall atmosphere dynamics still fairly unstable over most parts of Peninsular India the thunderstorms are set to continue today as well over most of Tamil Nadu. This unstable conditions are likely to persist for another couple of days before the expected Low Pressure over North Bay starts moving towards Central India bringing back the monsoon dynamics briefly into the Indian Sub Continent. 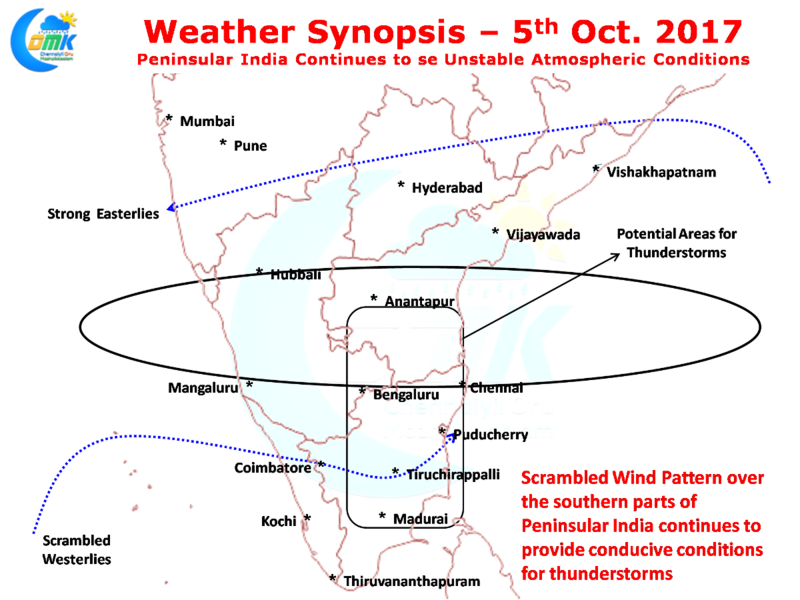 The Northern parts of Peninsular India has been seeing consistent Easterlies at lower & mid levels while South of 13N latitude possibly the winds are more scrambled creating conducive conditions for thunderstorms to develop over South Interior Karnataka, Rayalaseema & Interior Tamil Nadu. The multiple circulations across the Indian Sub continent is the reason for such scrambled wind pattern in the region. Once again we are likely to see places about 50 – 100 kms from the Coast enjoy the best spells of thunderstorms. Like yesterday the steering winds are expected to be weak hence the storms will move slowly dumping rains along the way as they pass. The poor steering winds could possibly go against the coastal places though it cannot be said for sure. Places like Chennai are expected to see localized late afternoon thunderstorms under the influence of sea breeze front which is expected to be strong like the last few days and is expected to move about 50 kms inland providing the trigger for these thunderstorms over places to the West of Chennai.